The Reverend Carolyn Patierno has served All Souls since 2001. This call is her first having graduated from the Pacific School of Religion that same year. 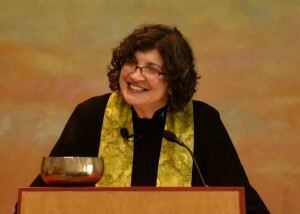 In the course of her tenure, the congregation has experienced a range of transitions including buying, renovating, and then settling into a new home, hosting and sharing space with a local non-profit that serves homeless men and women, staffing for growth and transitions, and an ever evolving congregation. All of these keep congregational life interesting and dynamic! Prior to seminary, Reverend Carolyn was an HIV prevention & sexuality educator. This work meant traveling throughout the United States and abroad as a trainer and health advocate. Previous experiences that also influence her ministry include having been an actor and preschool teacher. She was raised Roman Catholic and found Unitarian Universalism as a college student in 1981. Within our walls Reverend Carolyn has a particular commitment to children and youth and their spiritual and religious exploration. She leads the Coming of Age program and each week during the service shares the Story for All Ages. As well, she takes very seriously the connection between a faithful life and one that is dedicated to the creation of a more just world. Beyond our walls she serves as a founding Board member of the New London Homeless Hospitality Center as well as other ministries dedicated to creating peace. And she likes to have fun, celebrate, to pay attention and reflect on all that is our lives. Worship engages all of these commitments and Sunday mornings is Reverend Carolyn’s favorite time of the week. With all of the congregation, she looks forward to welcoming you to All Souls. You can contact Reverend Carolyn by clicking on the email icon above her photograph.